You might not recognise this online sportsbook but despite being one of the newer faces on the online, players can expect to find some of the best markets and range of sports available. If you are the type of player who thinks that they would like to try their hand at a bunch of casino games and slots, we suggest you check out the Karamba Casino, which has scratch cards and live dealer games for their players to enjoy. Karamba Sports has gone as far as providing their players with a mobile betting app which can be found on both the iTunes and Google Play stores. This gives players a lot of freedom and potentially enables them to play from anywhere in world, so long as there is a stable internet connection. For this review we shall be delving into all the details no matter how big or small surrounding Karamba’s sport section. Karamba have used a minimalistic layout for their sportsbook and this includes their colour scheme which just consists of shades of grey with different shades of blues making up the headers. Up in the top left-hand corner is a dropdown menu which pops out when you click on it. Here is where you’ll locate links to the various other sections of the site, including the login, live chat, VIP club, information, change language and promotions. Next to the dropdown part are some links to the live casino, casino, sportsbook and scratchcard sections. At the top of the homepage in the middle of the page is the Karamba logo and to the right of this where players can login and there is also an option to swap which format the odds are displayed in. Below the menu at the top of the page are some sport related links. Here you’ll be able to find links to the live betting section, cash out, results and KaramBOOST! Further down the page on the left-hand side are some handy sections which are built from some popular searches from other players. Beneath is a sports tab that contains links to all the different sports, the respective leagues and markets. Over on the other side of the page is your Karamba betting slip, which updates as you play. Directly underneath is a Karambot which provides betting tips for some of the more popular games that you’ll find at this sportsbook. You’ll find a brief overview of the different sports that are happening and are due to start, in the middle of the sportsbook, giving you a taste of what to bet on. You must admire Karamba for their efforts, as they have managed to sneak a monumental amount of sports into this sportsbook and players will find some of the most popular sports, leagues and competitions. This includes sports like Football, Tennis, Basketball, Ice Hockey, Volleyball, Badminton, Aussie Rules, Baseball, Chess, Boxing, Cricket, Darts, Cycling, eSports, American Football, Futsal, Gaelic Football, Gaelic, Hurling, Handball, Golf, Motor Racing, Rugby League, Netball, Rubgy Union, Rugby League, Pool, Snooker, Speedway, Specials, Trotting, Table Tennis, Surfing, Pesapallo and Water Polo. Players who sign up and create a new account with Karamba Sports will be able to sink their teeth into a free bet worth £15. This is awarded when you make a qualifying deposit and bet of £10. The free bet will then be credited into your account within 48 hours. There are some terms and conditions for the free bet welcome promotion and players need to make the qualifying bet on markets that have odds of 2.00 or greater. When making the qualifying deposit for Karamba’s free bet offer, players must make the deposit via a banking method like a credit or debit card, instead of an e-wallet. After you’ve used up the welcome bonus, players will be pleased to know that there is another promotion that specifically targets their sportsbook and although it might not be as good as the free bet, it should still be enough to catch your eye. Karamba is offering players up to 77% more winnings on accumulators that contain four or more legs. By clicking on the live betting option on the horizontal menu towards the top of the page, this will open up Karamba’s in-play console. This is one of the nicer live betting sections that we’ve seen and there is a decent selection of sports to be found here, including Tennis, Football, Badminton, Volleyball, Cricket, Bowls, Table Tennis and Cycling. You won’t be short of live markets because Karamba have seen to it that they have a huge amount ready and available for their players to wager on. As we covered earlier on, players who want to enjoy what Karamba has to offer but from their mobile device or tablet will be able to do so, thanks to Karamba’s handy mobile betting app. The app can be found downloaded on both iOS and Android devices, so no players are left behind. The sports betting app isn’t a requirement, however and if you’d prefer not to download any additional software, you can still enjoy the great experience of playing from your mobile phone but from Karamba’s website. This is accessible from your web browser of choice. There’s lots of different ways in which you can keep on top of your Karamba betting account and this includes all the popular banking methods, such as Maestro, MasterCard and Visa Debit. You’ll also find that there are several e-wallets which you can use such as Skrill, Neteller and Paysafecard. The benefits of using an e-wallet in this current day is that there are by far more efficient when it comes to withdrawing the funds into your bank account. The main downside with them is that players are unable to qualify for certain promotions or welcome bonuses by making the opening deposit via an e-wallet. Players can reach Karamba’s dedicated customer support team by using a few different methods. These consist of telephone, email or by using their live chat service. The support that Karamba offer to their players is extremely efficient and you won’t have to wait around waiting for a response. Despite being such a recent addition to the online sportsbook scene, Karamba have been turning heads and have created a platform which is by far one of our favourites of recent times. There is everything from a wide selection of betting markets, to one of the more accomplished looking betting apps and plenty in between. On top of everything, they have come up with a welcome bonus in the form of a £10 free bet which you can use on the Karamba Sports section. 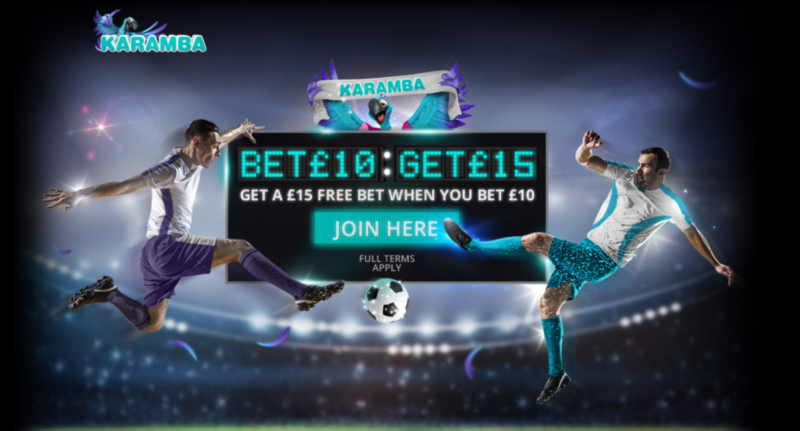 The free bet is a great way to see what Karamba have to offer, without having to commit much of your own money in the process.